G. Lane Ware was a prominent attorney and civic leader in central Wisconsin for 49 years and represented numerous Wausau area businesses and major corporations in corporate and governance issues. 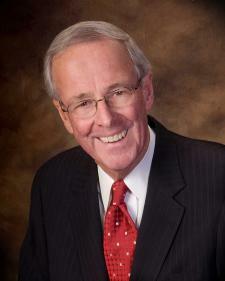 His experience in business and securities law played a key role in the growth and expansion of many area businesses. Lane Ware began his legal career at the Ruder & Staples law firm after graduating from the University of Wisconsin Madison Law School in 1965. Ware led his firm through a tremendous growth period as president from 1972-1999. Today, the firm that bears his name, Ruder Ware, employs 40 attorneys in Wausau and Eau Claire. A proven leader in both his profession and his community, Ware served as president of the State Bar of Wisconsin, the Marathon County Bar Association, the Wisconsin Law Foundation, the Wisconsin Law Alumni Association, Central Wausau Progress, the Wausau Region Chamber of Commerce, the Marathon County Economic Development Corporation and the Wausau Area Performing Arts Foundation. Sadly, Lane Ware passed away June 5, 2014.